Every saga has a beginning. Now there are two of them. To make one of the most ridiculous movies ever even more ridiculous. 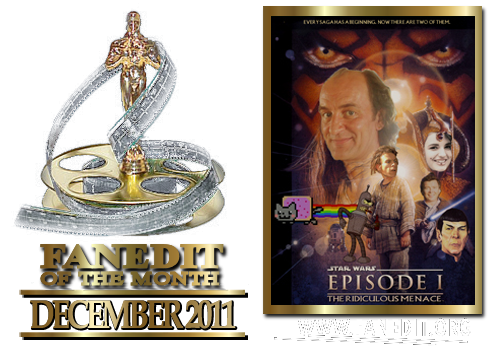 Ric Olie, for his inspirational work in The Phantom Menace. Also, see the end credits of the movie. - New voices for C3PO and TC-14!!! 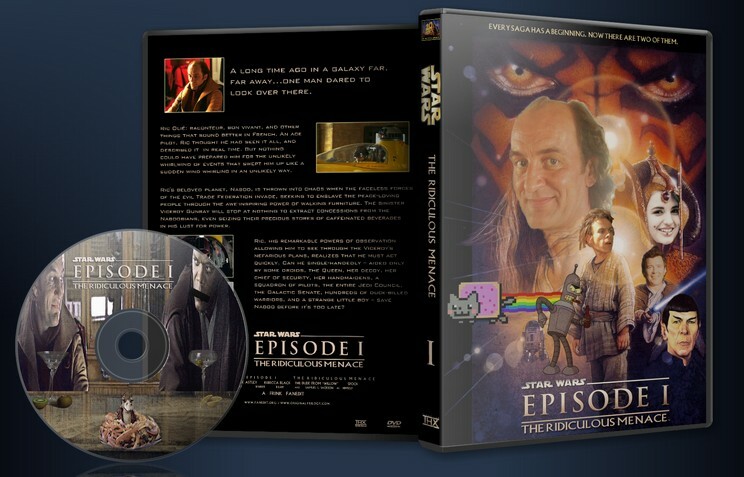 - Newly created subtitles for Jar-Jar, Boss Nass, R2D2, and more!!! - Music by Boston, Meco, Weird Al, The Cranberries, Rebecca Black, Bad Lip Reading, The Futureheads, Katrina and the Waves, Bill Murray, The Village People, and more!!! - Appearances by the voices of James Earl Jones, Peter Graves, General Zod, and more!!! - Catchphrases you won’t be able to stop using, from the likes of Nute Gunray, Anakin Skywalker, RIC OLIE, and more!!! - EVEN MORE RIC OLIE!!! - A better use for midichlorians!!! - A new winner in the podrace!!! - Shocking revelations, including the new father of Anakin Skywalker!!! - More rude and incompetent characters than you can shake a lightsaber at!!! 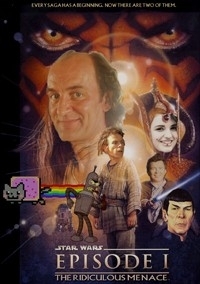 - Internet memes by the starcruiser-full!!! - DID I MENTION MORE RIC OLIE?!?!?!!!!!1!111!!! - A new crawl featuring absolutely zero exposition!!! - The first ever use of a Garmin in a Star Wars movie!!! - AND SO VERY, VERY MUCH MORE!!! Bloody hilarious. Editing isn't seamless, but nor would you expect it to be. Many things throughout are a testament to Frinks skill as an editor, even if the audio makes you question it. Bottom line is: this is very, very funny. Favourite moments: Qui-gon trolling people with the comm,and Obi-Wan misjudging the jump during the Maul battle. Priceless. Oh, and replacing "force" with "wookies"? Love it. I recently realized that I had never left a proper review for this edit, even after seeing the footage so many times when Frink put out the edit originally. This was definitely something I needed to remedy, and I finally had some time this evening to give it another spin. After 5 years, I was curious to see how the gags would hold up. Nothing to fear there! Not only did they hold up, but this edit aged like fine wine. Well, maybe some halfway decent boxed wine. I forgot how many great gags were in this and I laughed out loud (loudly) at several points during the film. Some of the jokes are dated to pop-culture of 2011, but that somehow made them even more amusing (2016 could have used a lot more nyan cat). Some of the audio editing is rough in spots, and while that is usually distracting or a deal breaker, it adds to the charm here. Some of the jokes will go over the viewers head, and others may overstay there welcome, but so many are ROFL-worthy. I've really grown to loathe the prequels over the years. This is now the only way I intend on watching them moving forward. Thanks Frink! Little Anakin is now mentally challenged. Jar Jar is struggles to suppress the voices in his head. Obi-Wan’s spirit has become disconnected from his body and refers to itself in the third person and that’s just the tip of the iceberg. How Frink has retained any narrative sense in this edit while tampering so heavily with the plot I will never know. Entire sequences are altered and rearranged yet I never felt lost. Running jokes constantly appear but never once did they overstay their welcome. Some attempts didn’t always land (generally due to not having any prior knowledge of the inserted material), however they didn’t come off as try-hard or cringe worthy. Once the credits rolled I realised my face was aching, there was hardly a moment I grinning in delight as I was bombarded with an absurd array of gags and jokes. The musical sequences in particular were hilarious. Only a couple instances did the dialog chopping/editing become messy, the the ‘ipod’ sequence stands out, but for the most part the background noise/effects accompanying the dialog wasn’t troubling. Again, only once or twice did the tone of dialog placed upon characters feel out of place. Thinking of this edit as a foreign language dub allows you overlook mouths not matching the dialog. This edit was fantastically funny throughout - my congratulations Frink, you created something special. I just watched this on Vimeo, good lord hahahahahahahahahaha, i had to stop it a couple times cause I was laughing so hard. Brilliant! TV's Frink has made Episode I into exactly what it was from the beginning: a joke. Due to some clever editing to pretty much everything, I found myself enjoying and even laughing aloud at what must be one of the most creative edits I have seen in a while. Let me fill you in on what I did, and didn't, like. -All of the droids are absolutely hilarious. Seriously. They're awesome. -Many of the conversations are refreshingly new, and they end up being really funny. -TV's Frink has mastered the art of elongated repetition, having the same thing being said just long enough to be really funny without being annoying. Think of the opening scene of spaceballs for an idea on how this works. -Really, most of the jokes were just funny. That's all this edit was aiming to accomplish and it did that. Alright, onto the the bad stuff. Don't let any of this deter you from watching this edit, because they are, very frequently, a side effect of the silliness. -Some of the lines TV's Frink used to create new dialogue have the background music attached to them, which is an unavoidable side effect. -There were a couple jokes that didn't really work, but I might just not have really understood them. -The abundance of splicing he did ended up with (sometimes-distracting) visual and audio glitches. -The storyline was damaged... but that is not too important to the edit. That's it. I would highly recommend this edit and would watch it again. Heck, might as well replace Episode I with this beauty.